When it comes to national parks and wildlife sanctuaries, there are actually plenty in India. Almost every state has one or more than one national parks. So, when one wants to visit them, the list seems too long. Here are some options which one can keep in mind. This is a sanctuary which is a wide one and is spread in an area of 202 square kilometers. This is a place which is considered to be a paradise for those who love to watch birds. Many rare varieties of Indian birds are found here and some which are at the verge of extinction. Popular species noticed here are Bearded Bustard and Coloured Bustard. In total one can get to see almost 245 variants of species of birds in this region. Teals’ Indian Robins, Gadwalls and Pintails can be seen here as well. If visited in winter, one can observe a huge block of migratory birds which fly down here near the Dihaila Jheel. We all know that Royal; Bengal Tigers are available in Bengal. But there is another place in India where one can see the same species of tigers. And it is the Bandhavgarh National Park. This national park is said to be having the best jungle safaris among all the wildlife sanctuaries present in India. This place was once a popular hunting ground for the royal families and at present, it has become a reserve forest. To get the best safari one should visit here from October to June. But to get the best tiger spotting April and May are the best months. This is a national park which is located at a very high altitude and it covers an area of 600 square kilometers. It is a forest which is named after Hemis Gompa which is again a famous monastery here. This forest is located at the banks of River Indus and inside this forest there is a place called Rumbhak Valley, which is very popular for spotting of snow leopards. Special trek sessions are also conducted here in this forest for ones who want better spotting of leopards. This national park is located at a distance of 25 kilometers from the city of Hyderabad. Near this national park, lies the popular Himayat Sagar Lake. In this jungle, one gets to see a variety of trees like teak, sandals and bamboos. There are varieties of birds that one gets to see here like partridges, peacocks and ducks. 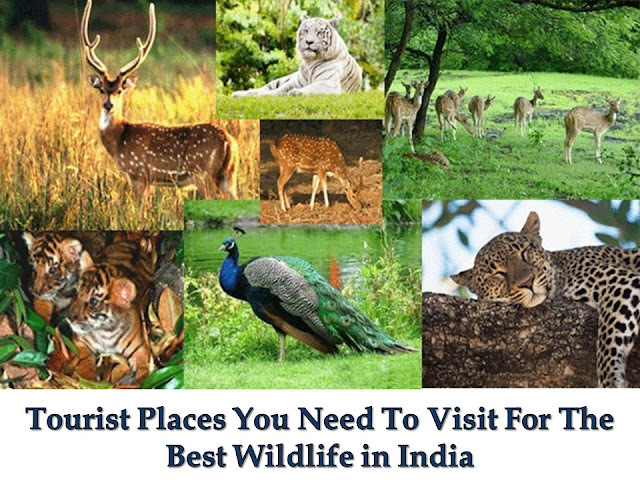 In animals, the common species found here are spotted deer, cheetals, sambhars and jackals. This national park is mainly for the bird lovers. The best time to visit this is definitely on winters. Each of these national parks can be easily reachable by trains and one can book their tickets online with a few clicks. To get food on train one can order on the catering services provided by the Indian Railways. Nice blog! Seems like a great project from the neatly framed article.